What does it mean to speak of a "Syrian Hezbollah" group? Do we just mean a group of Syrian fighters who adopt the Hezbollah brand, or one that has a direct relationship with Hezbollah? The case of the Special Force (Sayyida Zainab) sheds some light on this matter. The Special Force's origins go back as far as 2013. The key figure behind its formation was Hezbollah commander Ali Shabeeb Mahmoud (known by the kunya of Abu Turab al-Ruways). Originally from Labaya in the Beqaa, Abu Turab grew up in al-Ruways in the al-Dahiya suburb of Beirut. He joined Hezbollah in 1991 at the age of 15 and he participated in the 12 July 2006 Hezbollah operation that captured two Israeli soldiers and was the immediate trigger for the 2006 war between Israel and Hezbollah. Abu Turab, who had served as a training official in Hezbollah's elite al-Radwan unit, participated in the Battle of Qusayr in 2013 when Hezbollah's involvement in the Syrian civil war first became widely known. He received responsibility for the Sayyida Zainab front and was killed in fighting in Hajera near the Sayyida Zainab area in November 2013. It should be noted that recapturing Hajera from the rebels was one of the first steps as part of securing the Sayyida Zainab shrine from the threat of rebel attacks. 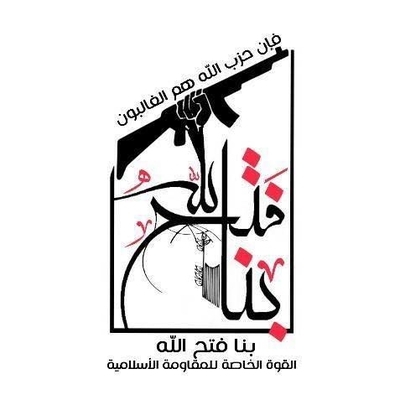 From Abu Turab, the Special Force takes its other name: "The Martyr al-Hajj Abu Turab Special Force." To this day, the Special Force's primary base is in the Sayyida Zainab area. The Special Force is currently part of the Iranian-backed Local Defence Forces (LDF) network, which it joined after the administrative decisions issued in April 2017 regarding the LDF and personnel wanted for draft evasion and desertion. That said, the group does not claim to have a direct relationship with Iran's Islamic Revolutionary Guard Corps. Instead, the Special Force characterizes itself as a part of Hezbollah, and has received training, arming and financial support from Hezbollah. A monthly salary for a member of the Special Force, depending on assignments, can go up to 90,000 Syrian pounds. An emblem for the Special Force. On top: "Indeed God's party are those who overcome." In centre: the familiar extended arm, rifle and globe, with the slogan: "In us is God's conquest." On bottom: "The Special Force for the Islamic Resistance." Most recently, the Special Force has been involved in the Syrian government's southern campaign, including participation in the capture of Tel Mashara and the village of Mashara in Quneitra, in close proximity to the borders with the Israeli-occupied Golan Heights. The Special Force has participated in those operations despite Israeli complaints about a need to keep away forces linked to Iran and Hezbollah away from the border areas.